Intropy: Facts, data and information. But above all, the narrative. Facts, data and information. But above all, the narrative. What are facts? Facts might be data or information (see below), but the word is used to emphasise something to be true. Facts distinguished from fiction. Facts that are ‘out there’ and objective, independent of the observer. In some narratives  of information, this would make facts the data, and a surrounding narrative would turn them into information. The insight is that data and information come in a pair. The point is that ‘out there’ is a sea of, of what? Of stuff, of differences. Practically – to all intents and purposes – infinite differences which might make a difference. They are not data. They are nothing to us, literally, nothing, unless they can fit into a narrative. Or rather, unless they can be converted (by one of my trapeziums) into an entity that exists in a narrative. So, facts-data-information are all of a kind, and only exist insofar as they take their place in a narrative. I was expressing my skepticism of 'facts' to my family in the car one day a year or two ago, but my elder son was not having it. He is active in the fight against climate change, so deniers denying the facts of climate change are a problem. I'm 100% with him on the importance of tackling climate change and the culpability of deniers but I think the problem is the narrative, not the facts. However, that's for another time. For the moment, I want to pick up on his illustrative argument: that it was a fact that on 25th May 2015* we drove to Winslow to visit my parents. And if someone says otherwise, they are simply wrong. *Actually, I can't remember when it was. But take it as then, for the purposes of the argument. I'm not saying that 'anything goes'. It is not that me saying "on 25th May 2015 we drove to Watford to visit Elton John" is on a par with me saying "on 25th May 2015 we drove to Winslow to visit my parents". The former is not true. The latter really happened. (Well, maybe, might have done, and assuming we agree on the meaning of the all the words.) But, there are almost infinitely more things that 'really happened'. All the other things we did on that day. All the other places we went to on other days. "At 10.43 and 12 seconds on 25th May 2015 I breathed in" might have 'really happened'. If I say "on 25th May 2015 we drove to Winslow to visit my parents" I am saying it for some purpose, as an entity in a narrative. Checkland and Holwell have a hierarchy of data-capta-information (and then knowledge), but I'm taking a more extreme line which does away with the distinction between data and capta. Checkland and Holwell were exploring information is a specific context of information systems, whereas I'm considering a more absolute philosophical question. The moment we acknowledge the existence of (an item of) data, then we are paying attention to it, so there's no data that is not also capta. Maybe also I'd argue that 'knowledge' is the narrative into which information is embedded. So here's my argument. Conventionally (figure (a) below), we envisage a limited number of 'facts', around which we build a narrative. Dispute is around specific facts. You and I disagree over a fact, and that fact changes our narratives. The facts are the objective entities out there in the world, and there is a limited number of them, so our narrative has to fit in with this valuable resource. Instead (figure (b)), I'm arguing that the narrative determines the facts. Not whether we went to Watford or Winslow on 25th May 2016, but whether we went to Winslow or I breathed in and out at 10.43 and 12 seconds on 25th May 2016. Facts are not, in this narrative, the fixed framework around which we build a narrative. 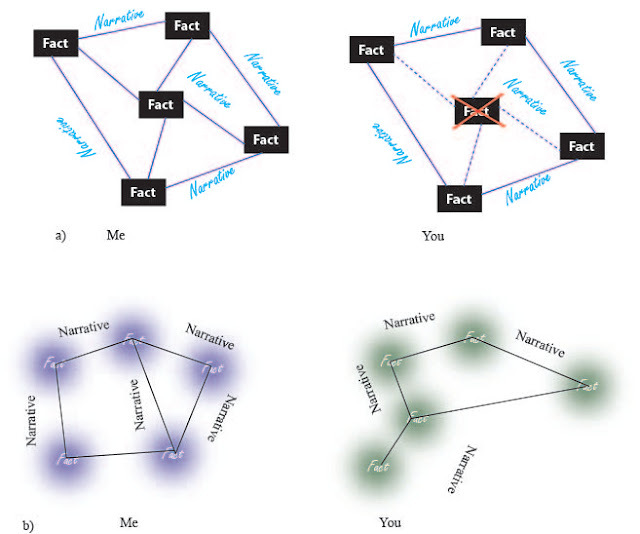 The narrative provides the framework which determines the entities which can exist within the narrative. 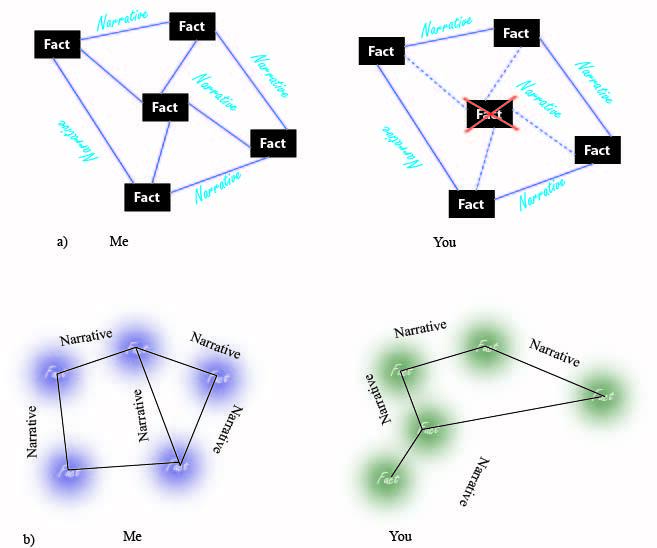 In figure (b), I've drawn the facts as fuzzy to indicate that they are, sort of, subservient to the narrative, but actually in a sense they aren't really any fuzzier than in (a). They are still entities within the narrative. Finally, remember what I say about this blog: it is always work-in-progress! 1. Source: me, 14/9/2016, in conversation with Magnus Ramage. But Magnus is not the ‘you’ above: far from it. The ‘you’ was a hypothetical third-party. It was a discussion with Magnus about the nature of facts, information and the role of narrative and the ideas herewith presented owe a lot to Magnus’s insights. 2. This gets dangerously self-referential. I am writing a narrative about narratives and information. 3. Holwell, Sue (2011) Fundamentals of Information: purposeful activity, meaning and conceptualisation. in Perspectives on Information (Magnus Ramage and David Chapman, Eds.) Routledge, New York, 2011. pp 65-76.